Seniors – Of course I’m an adult. Boomers – I’m an adult but I don’t have to like it. Gen X – I’m an adult and can do what I want. Millennials – I’ll never be an adult. Gen Z – I don’t need to be an adult to make a difference. The generation that started all this talk around adulthood is, of course, the introspective (some say selfish) Millennial. For Boomers, it’s somewhat humorous to realize where Millennials are now, adulting in spite of themselves, and asking for validation and for us to be proud of them. So, OK. On behalf of the Boomer generation I’m thrilled to see Peter Pan evolve. We Boomers grew into adulthood expectations without knowing we had a choice. Then, thanks to Robin Williams and Dustin Hoffman in Hook, we realized that retaining something of our childhood fantasies just might be important in being a whole person. We might even have been a bit jealous of Millennials. Millennials came at it from the other direction—clinging to their childhood so as not to become the work-obsessed Peter Banning instead of the playful Peter Pan. They grew older, but lived for the nostalgic reminders that made them feel like a kid again. In the meantime, Gen X—the unsung generation—took advantage of being ignored and latched onto the best part of growing up: the ability to live without someone else telling you what to do. They moved steadily along, forming companies and changing work cultures and starting families in new ways. Millennials reaped the benefits of these game-changers, often getting credit since forecasters were never really sure where Millennials began. Now, we know that the oldest Millennial is mid-thirties, and that those in their mid-40s are still changing the game. Millennials are eating their words these days—reluctantly moving from “you can’t make me grow up,” to “I kind of see the advantages of growing up.” They see how the numbers add up and are starting retirement accounts, buying homes, even marrying. After all, they are independent, not foolish. When adulthood is redefined as “not boring, but smart,” then they may actually decide to go ahead and play along. Sure, they’ll continue making fun of themselves as “not really an adult,” but they’ll be one in spite of themselves. Part of what’s pushing Millennials to grown-up status is the new Gen Z. This generation is more entrepreneurial, more independent, more adventuresome, and more financially savvy than previous generations—and they won’t wait for Millennials to move before they do. The patient Gen X has been waiting for Boomers to retire, but that’s a pattern you won’t see in the future. It’s every woman for herself, and every man for himself. The point is, we are all adulting in our own way, accepting some facts of life and rejecting/reforming others. It’s inevitable to gain wisdom as you age, along with at least some understanding of finances and employment. Adulting is good for our economy. I’m an adult, and even if I don’t always like it, I accept it. 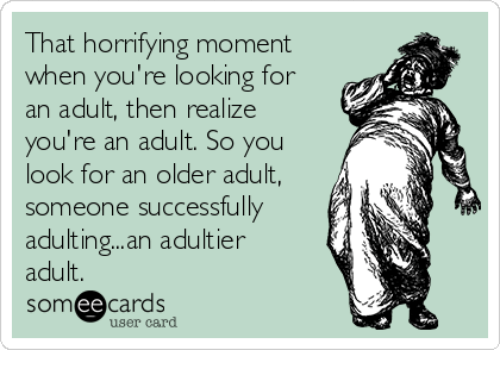 Unless I can find an adultier adult.